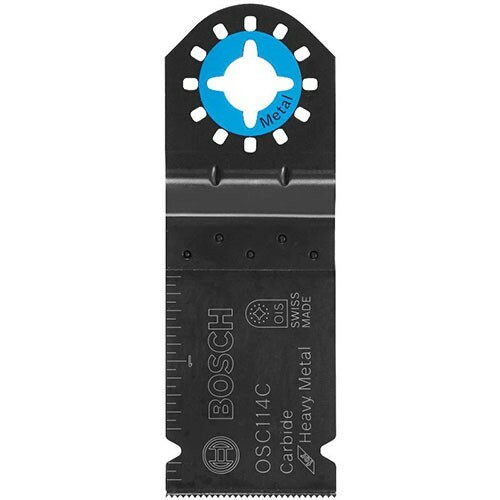 The OSC114C is a true carbide tooth blade that features carbide teeth that have been welded to the high-carbon steel body of the blade using Bosch's proprietary process. Bosch says the carbide teeth can cut through metal, wood, fiber board, cast iron, ceramic tile, plaster and more. "The carbide blade adds an important new capability to our multi-tool offering. This is a professional tool made for the needs of the professional user," said Pugina. "Our customers have told us about their need to make precise, really strategic cuts in various materials - and in situations where they can't change blades all the time. This is our response to their request." I imagine this is similar to the Dremel carbide blades that were announced back in April. 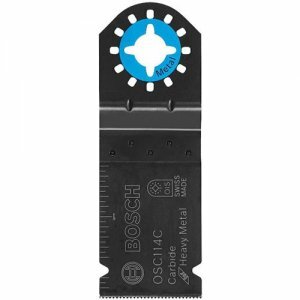 Bosch says that their blades use a thicker metal for the interface bracket at 1.25mm versus 1mm on a typical blade, which reduces vibrations. You will also notice the new color coding system that Bosch has started using for their blades and that it also offers additional multi-tool compatibility on top of their OIS standard.